U.S. stock futures were rising Monday, April 30, as Wall Street processed a mega-merger between Sprint Corp. (S and T-Mobile US Inc. (TMUS and as Walmart Inc. (WMT said it would sell its supermarket business in the U.K.
Contracts tied to the Dow Jones Industrial Average rose 100 points, while those linked to the broader S&P 500 gained 7.60 points. Futures for the Nasdaq were up 26.75 points. The U.S. economic calendar on Monday includes Personal Income and Outlays for March at 8:30 a.m. ET. Later in the week, the Federal Reserve will make an announcement on interest rates and the Labor Department will release the jobs report for April. Earnings are expected Monday from McDonald's Corp. (MCD , Allergan PLC (AGN , Arconic Inc. (ARNC , Transocean Ltd. (RIG and Dish Network Corp. (DISH . Allergan is a holding in Jim Cramer's Action Alerts PLUS Charitable Trust Portfolio. Want to be alerted before Cramer buys or sells the stock? Learn more now. Shares of Sprint fell 12.6% in premarket trading to $5.68 on Monday, suggesting investors may be cautiously approaching the company's proposed $26.5 billion merger with T-Mobile amid concerns regulators could block a deal that would reduce competition in the country's wireless network space. 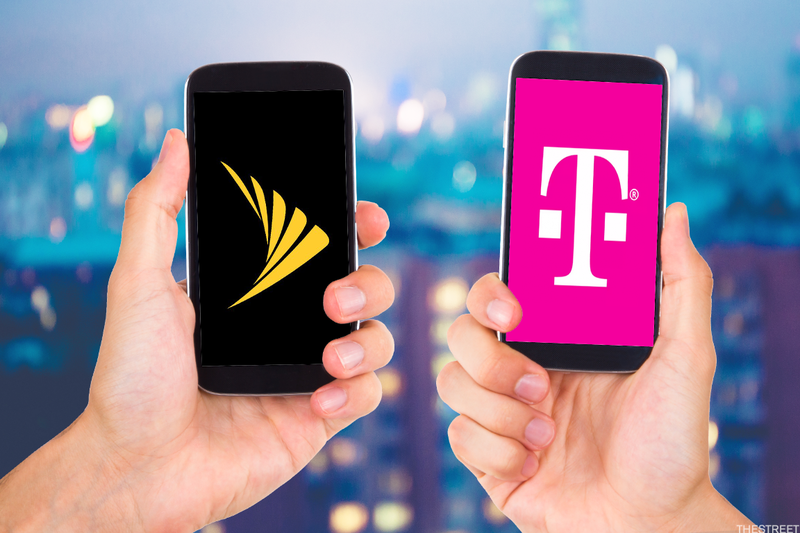 Sprint was valued at $6.62 a share in the blockbuster deal with T-Mobile, based on a ratio of 0.10256 a Sprint share for each T-Mobile US share, which the companies said was based on Friday's closing prices of $6.50 and $64.52, respectively. However, Bloomberg said the ratios were based on April 9 closing levels, suggesting the tie-up values Sprint at $6.12 a share. The proposed deal will certainly face scrutiny from both the Federal Communications Commission and the U.S. Department of Justice, the latter of which rejected T-Mobile's $39 billion sale to AT&T Inc. (T in 2011. "This isn't a case of going from four to three wireless companies," T-Mobile CEO John Legere, who is tabbed to lead the combined company, insisted on a conference call Sunday, April 29. "There are now at least seven or eight big competitors in this converging market." J Sainsbury PLC (JSAIY agreed to buy Walmart Inc.'s U.K. unit, Asda Group Ltd., for £7.3 billion ($10.1 billion) in cash-and-stock in a deal that will create Britain's largest supermarket chain. The deal would mark a major change in strategy for Walmart in the United Kingdom after years of declining market share. Walmart will own 42% of the combined company, and will receive a cash payment of £2.975 billion that ultimately values Asda, the third of the so-called "Big Four" U.K. supermarkets, at £7.3 billion . A combined Sainsbury's and Asda will have annual revenue of around £51 billion, the companies said, with 2,800 stores and 47 million customer transactions per week. "This is a transformational opportunity to create a new force in U.K. retail, which will be more competitive and give customers more of what they want now and in the future," said Sainsbury's CEO Mike Coupe. "It will create a business that is more dynamic, more adaptable, more resilient and an even bigger contributor to the U.K. economy." The merger combines the U.K.'s second- and third-largest supermarket chains, giving the combined company 31.4% of the market and putting it ahead of the current leader, Tesco PLC (TSCDY , which has 27.6%, according to data from Kantar Worldpanel. Marathon Petroleum Corp. (MPC confirmed it will buy pipeline and refining company Andeavor (ANDV in a deal with a total equity value of $23.3 billion. The Wall Street Journal had reported the deal could be announced on Monday. Under the deal, Andeavor shareholders can choose 1.87 shares of Marathon Petroleum stock, or $152.27 in cash, which represents a premium of 24.4% to Andeavor's closing price on Friday of $122.38. Marathon is the second-largest refiner in the U.S., according to its website. Andeavor, formerly known as Tesoro, operates 10 refineries in the western U.S. with total capacity of more than 1.2 million barrels a day. Prologis Inc. (PLD agreed to buy rival logistics-property owner DCT Industrial Trust Inc. (DCT for $8.4 billion, including debt. The deal values DCT at $67.91 a share. The stock closed Friday at $58.75.